As one of Chad's dental student requirements he was to participate in the Oral Cancer Walk that was held last Saturday. So of course we wanted to support him and so our little family all packed up and drove into Harlem where the walk was to begin. We started out at the Marcus Garvey Park where Chad checked in and a couple of oral cancer survivors spoke before the walk began. This was New York City’s third annual Oral Cancer Walk to raise awareness of a disease that kills over 7,000 American men and women each year. So we put Edyn in the stroller and Ethan on his bike and we were off. The Walk was 4 miles, so we were told, but I really enjoyed myself. The weather was beautiful and it was really neat to take part in such a great cause. We were so glad that we took Ethan's bike as he was as happy as a peach peddling along side everyone. He was getting pretty good at balancing his bike and keeping his training wheels off the ground. I know that if he was on foot he wouldn't have lasted nearly as long and we would have heard all about it the entire time. So smart thinking Chad! After the walk there were free oral cancer and health screenings available and the kids got free toothbrushes, floss, and coloring books. They were pretty excited about that. We then headed out to eat with Bryan and Ryan (who were kind enough to walk the entire way with us) in which I got a phone call from my mom informing me that she and dad were in the middle of a snow blizzard and could barely get out the front door. So sorry to hear mom, but were enjoying our 80 degree weather! I'm sure you'll enjoy it in a couple of days when you visit too! Last week I was out and about with Edyn running some errands and what do you know . . . this is what we had to stop for at the cross walk! Funny how geese know better than humans what a crosswalk is for! LOL. FUNNY STORY -- Well, at least I think so! About a month ago, Chad had purchased quite a few major league baseball tickets for the Mets as well as the Yankees for a few different games. His thinking was to purchase a bunch so friends would be able to buy a ticket and be able to go or if he wasn't able to make the game he could go on EBAY and try to sell them and make some money. Well, on Sunday we were tidying up a bit and I pulled the chair over to the fridge to clean the top of it and I find all these baseball tickets. So I hand them over to Chad and he starts looking thru them. He then pauses and asks "What is the date today?" in which I told him that it was the 20th. All of sudden the boy looked deathly sick! He pulled 4 tickets out which were dated April 17th for the Yankees and Red Sox game. He had completely forgotten about the tickets and had missed the game completely. The Yanks VS. the Sox are the games that he really, really cares about. Yup, he's probably going to kill me for sharing that story cause he's pretty imbarrassed about it. So sorry hon, but I'm a horrible wife cause I think it's pretty hilarious! Speaking of Baseball, we went to a Mets VS. Brewers game with some friends at the beginning of the month and had a great time. 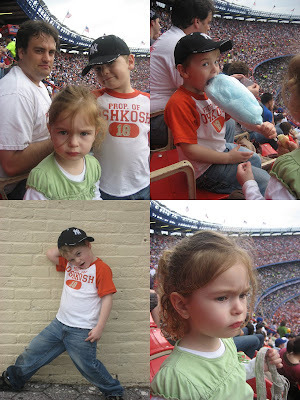 Here's some pics of the family enjoying themselves at Shea Stadium. Yesterday around 5pm the kids and I went to Walmart to pick up a few fish to use as a table center for the preschool that I had taught today. Our theme this month is nature so I decided to do it on FISH. The man that helped us was really nice and actually ended up giving us 3 extra fish because he felt that they were going to a better home. Well, little did he know! He really should have kept them, you'll see what I mean in a bit. We brought them home and put them in a fish bowl, that was nicely done up for them, with rocks on the bottom and a fake plant for them to swim around and nice cold water. Anything to make them happy so they would still be alive before preschool. Preschool came and what do you know! One of the moms pointed out that there was a dead fish! So lesson number one for the kids . 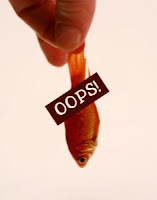 . . how to flush a dead fish down the toilet! Not exactly how I had planned on preschool starting. The rest of preschool went well and once everyone went home Edyn and I left to pick up Ethan and run a bunch of errands. Came home and what do we find? Three more fish dead! Honestly, Naomi! It hasn't even been 24 hours! So all I have to say is either Walmart fish aren't meant to stay alive or I'm an awful FISH MOMMMY! UPDATE: 5 minutes afer posting this, Ethan informed me that one more fish is dead! So now we have only one more left. Any bets on how long he's gonna last? DON'T TRY AND TAKE CARE OF ANYMORE FISH!!!! I've seen MTV cribs, Lives of the Rich and Famous, etc. But NEVER in my life have I seen a home like this in REAL LIFE! We were driving out in the middle of nowhere in Ohio and came upon this on a side road. Our jaws hit the floor, a couple of times! Then are minds started whirling wondering who could possibly live here. Is it someone famous? Is it a second or third home for somebody? What kind of work were they in to be able to live in such a place, and so forth. The pictures don't even give justice to the enormousity (hmmm, did I just make up a new word?) of this home. We would have loved to drive up to it but it was blocked off by a huge gate. OK - One thing I will definately not miss when we move after Chad is done school is making sure our car is out of the way 4 times a week for street cleaning! This has truly become an annoying part of Jersey! We have done pretty good for the last year in making sure we dont' get a ticket but this morning that all changed! Around 10 to 8, I had the feeling that I better go move the car into the driveway (our landlord had already left for work so the driveway was open) but then quickly changed my mind because I had lots of time to get the kids ready and into the car before the street cleaner came. They usually go up our street around 8:35am. Never before. Then again around 8:05 I thought, maybe I should just go move the car and get it done with. Once again, I thought I had lots of time. Well what do you know, the street cleaner came 7 minutes later! Usually the ticket guy chirps his car to give you a little warning that he's there and gives you a few seconds to move your car. NOT this morning! I was doing Edyn's hair when all of a sudden I hear the street cleaner, jump to look out the window and sure enough the ticket car has pulled up right beside our van. I jump up, grab the keys and fly down the stairs and reach the car right as the ticket is being placed under the windshield wipers. CRAP is all I have to say! I'm not mad at the ticket giver, they are only doing their job . . . a job that shouldn't exist, the cleaners only move the mess around. But that's another story. I'm just really, really mad at myself for not following my instinct/prompting to move my STUPID Van! AND OFF TO KIRTLAND WE WENT! Chad's springbreak finally arrived! It seemed like it was never going to get here. Realizing that we only have a little over a year left on the East coast we better start seeing the places we've been wanting to see before it is too late. So we as a family decided to visit Kirtland, Ohio, and check out some of the historical church sites. We headed out on a Saturday morning and arrived in Independance (a little town just outside of Cleveland) that night. I swear, if I received a dollar for everytime I heard "When are we going to get to the hotel?" I'd be filthy rich! Ethan really doesn't care where we go as long as there is a hotel with a swimming pool involved and it has to be close. He has no patience for a long drive. Or so he has told us. So here are some pics of our first night letting the kids wear themselves out so we would get a good night's sleep. And, it worked! Got up the next morning and dressed for church and headed out to Kirtland. Oh, it was so nice to be back in a regular church building. Well to be honest, it was really weird for us. I can't remember the last time we sat on a church pew and had a young man pass the sacrament to us. One thing we did appreciate and missed was how friendly our ward in Jersey City is. Not one person approached us and said hi or reached out a hand to welcome us. It really didn't bother us but it was something we did take note of and made us all the more appreciate our home ward. I'm sure Kirtland gets more than it's fair share of visitors so who can blame them. After church we headed over to "Historic Kirtland" and went on a wonderful tour by Elder and Sister Cluff. Our family immediately fell in love with them. They were so loving and so full of information and their testimonies of the gospel and Joseph Smith really touched our hearts. I think the Newel K. Whitney store and the school of prophets (a room in the store) was my favorite. We didn't quite finish the tour as they wanted us to catch the last Kirtland temple tour before they closed. So we left and hurried up the hill to see that. The RLDS (now known as "The Community of Christ") own the Kirtland Temple. Our guide was full of so much information I was bursting at the seams. Sorry we have no pictures of the inside, we were asked not to take any. I was very impressed with the size of the temple and that it was still standing. I can't even imagine the hard work that must have gone into it by the early Saints. We even got to walk into the quarry where the stone was taken from. Very cool! After our tour we headed back to "Historic Kirtland" to finish our tour with the Cluffs then off to the hotel. Here's some pictures of our visit in Kirtland on Sunday. Monday we headed out once again to the surrounding area of Kirtland to the Morley Farm and the Johnson Farm. The 80 acre Morely farm was offered as a settling place for Saints migrating to Kirtland from New York. Joseph lived here for about 7 months and this is where their twins Thaddeus and Louisa were born and only lived a short 3 hours. The Morley farm didn't have too much to see except for a little hike up the hill and a plaque telling us where the log school house was approximately located. This is where the 4th general conference of the church, the 1st conference in Kirtland, was held. After that we headed over to a few Amish towns but was surprised not to see very many Amish people out in their horse and buggies. We maybe saw three at the most. Definately not like Lancaster, Pennsylvania, where you saw them everywhere. We ate at Mary Yoder's Amish Kitchen and it was so YUMMMY! When we were heading out we ran into this sign! We got a good kick out of that one. We then decided to try and get the Johnson Farm in before we headed out. So glad we did. That was an amazing stop. The home is original with restorations here and there but it was so cool to see the place where Joseph and Emma lived for a year after they left the Morley Farm. We got to walk into the bedroom where the mob broke in and grabbed Joseph taking him away from his family and sick children only to tar and feather him and even tried to poison him. We got to sit in the upper room where Heavenly Father and Jesus Christ visited Joseph. 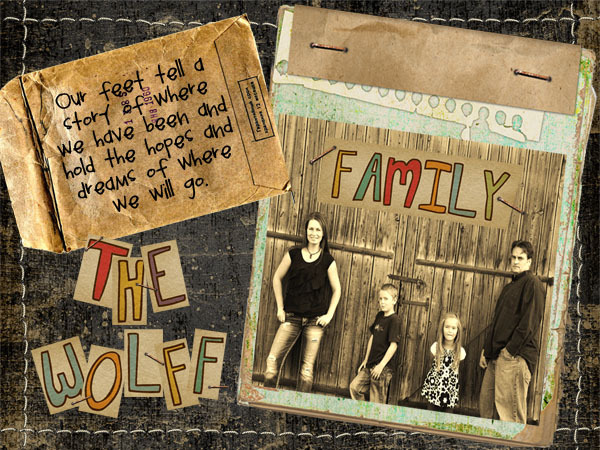 While living in the Johson home, Joseph received at least 16 revelations found in the Doctrine and Covenants. One of them being the marvelous vision of the three degrees of glory. We got to stand on the front porch where Joseph preached to the congregation the day after he was tarred and feathered. It was so surreal. I think the John Johnson Farm was one of our favorite stops this whole trip. So much history in Kirtland and I came to realize just how little I know about the early Saints. I sure did gain a greater appreciation for them and their sacrifices and my testimony of the restoration of the gospel of Jesus Christ was increased. This is definately a trip I will never forget.